MidLaw has observed a temporary supply imbalance in the market for fresh, vine-ripened tomatoes in farmers markets across relevant regions. Arbitrage opportunities may obtain. Accordingly, MidLaw is led to reprise the following item which was originally posted at MidLaw & Divers Items on July 2017, 2013. Readers should gauge their responses based upon their own assessments of market conditions in their particular regions. Then, obtain fresh, local, vine-ripened tomatoes. Tomatoes grown in Edgecombe County, North Carolina tend to be best for this purpose. But Guilford County tomatoes are very good. 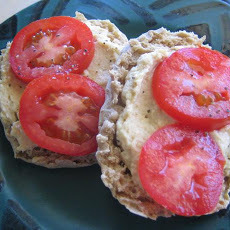 Serve halved or quartered tomato slices either in the dish with your hummus or on a separate plate. Take a moment to appreciate natives of the Andes for first cultivating tomatoes; peoples of the eastern and southern Mediterranean for chic peas and sesame paste; and eastern and northern Mediterranean peoples for the olive oil. Good people. Note: This seasonal suggestion has been found to work well as an accompaniment to eggs, and also with mayonnaise, bread, bacon, and lettuce.